HI AND WELCOME – My name is Sam and I’m a mixed media artist – with a huge love for stories and story telling in all its forms…at the moment I live on the East Coast of England. My mixed media sculptures and art dolls combine all my creative urges …costume, theatre, sculpting, story telling, creating, tinkering…playing… Each figure is entirely made by me, by hand, using either clay or fabrics over a wire armature ( – sometimes both, but always with clay heads), and paint, wood, found objects, various textiles and textile techniques, and a sprinkling of imagination to depict the characters I have met, seen, dreamt of or imagined – little people with large personalities … all one of a kind and unique individuals… much like us larger people. Each character has their own story. Please click on the links at the top of the page to come exploring…. Sam Crow was born in the Far East, and has been gradually travelling West ever since with a sewing needle in one hand and a pen or paint brush in the other, scribbling down the bizarre characters she either meets or imagines, costume ideas and jumbles of words …whilst enjoying and absorbing the rich textures, colours, cultures and faces on display, and developing an insatiable appetite for stories and story telling, and everything creative or magically theatrical along the way. An enormous love for the theatre / cinema and arts – and a disturbing passion for textiles, puppets, masks and costume eventually took her to Central St Martins to study theatre design, specializing in costume. Her subject matter is heavily influenced by her great love of all forms of story telling, especially fairy tales ( both dark and light), but also costume design, fashion photography, steampunkery, old photographs and stop motion animation -and depicts characters from life or imagination that want to come out to pose! She is happiest when creating things with her hands, listening to music, surrounded by fabrics, ink, paint, clay and their associated smells, mess and potential, and always has a huge smile for creativity and stories and the characters they contain … imaginary or real, on stage, screen, page or pavement. She hopes her work will make you smile too, and inspire you to daydream and imagine the stories surrounding every character on display. As a small child she ran off to join the church choir, took dance lessons until her late, late teens and developed a habit of singing ( loudly and badly ) or dancing whenever she was completely alone…she still does this…often! although she’s far too embarrassed to ever admit it. She adores watching other people dancing…lost to the music…in every form of dance…Ballet to street, tap to Futterwaken. 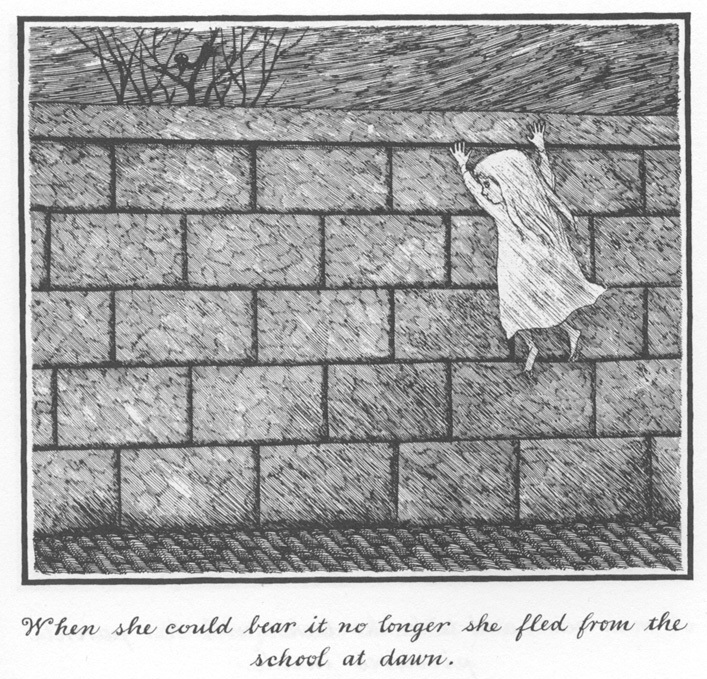 Her first three years of boarding school mainly consisted of planning and carrying out daring escapes to her grandparents home … she was always returned after the weekend with her pet stone. The absurd, Monty Python, Terry Pratchett’s, hearing children chortling, and Withnail And I always make her giggle. She loves the works of…………………………………………………. Tim Burton, Terry Gilliam, Laika, Lewis Carroll, Neil Gaimen, Edward Gorey, Haruki Murakami, Guillermo del toro, Rumi, Boris Vian, everything Brothers Grimm, Gormenghast and childhood-creepy…and too many more things to be able to fit on here! Exhibiting at The Harbour Gallery, Whitstable, Kent, 2010 -2011. Ink, Paint, Stitch exhibition, Creative Quarter, Folkestone, Kent, August 2011, part of the Folkestone Triannual Fringe exhibitions. The beautiful picture ‘Party Dress’ we bought from you at your recent exhibition now has pride of place in our home. The combination of materials and stitches are amazing. I am still enjoying it! I have long admired your outstanding work as I believe you realise. My family and I have a couple of your pieces of which we are very proud. Huge success is just around the corner. can’t wait to see you in tontine st – i’m liking the jar of jam ! oh Sam I am just stunned at your gorgeous art. Having spent 20 odd years ‘sewing ‘ for a living combining it with art I just wish I had time /energy now to do more [not like yours !! ][seeing I now have a superb machine as well as all my old ones.] gosh wish I could give you the boxes of fabrics and bits and bobs I have just languishing in cupboards. [ps I had to give up due to illness] I can still paint in oils though. not so demanding] cheers Gini. Hi Gini, thankyou so much for your lovely comment….i don’t get to sew on the machine as much as i would like either – due to illness too – but love it when i do! i looked up your art on red bubble…it’s gorgeous, you can tell by the wonderful use of colours and their textural qualities that you love fabrics and have had a lot to do with them! beautiful!Will go back and have another look now! thankyou , sam. Wow! Your artwork is amazing and your blog is just lovely! I love your doodles – very detailed and super creative. Following!!! wow! thank you lots Jess! Big smile! Hi Andy…that is such a great story…thank you so much for returning for him….it is great to know he is going somewhere where he will be loved…huge smile! so interesting to come across this.